This piece is as interesting as it is beautiful. 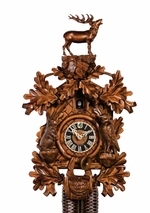 It is reminiscent of Black Forest clocks of the mid-Ninteenth Century with a raised trellis of leaves and beams. A beautiful deer adorns the top along with grape leaves around the rest of the clock. This is a large and striking clock. The large wooden weights make the clock a centerpiece of attention. When the clock strikes the hour or half-hour the door opens, a cuckoo appears and calls along with the clock�s gong strike. This piece features wooden hands and numbers.